The E-Scoop® glasses were developed to bridge the gap between standard eyeglasses and head borne telescopes. Whether your difficulty be night driving, bright light, sunlight, or simply seeing clearly in the distance, the E-Scoop® lens will help your patient see better. 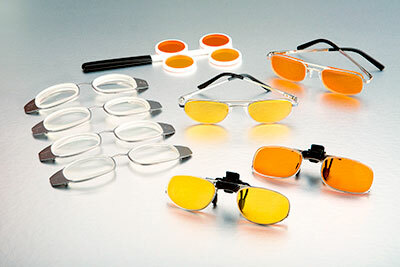 The E-Scoop® lens is comprised of five basic optical properties: custom tint, anti-reflective coating, special lens thickness, base curve, and base up prism (4 base, 6 base, or 8 base). When these five optical properties are combined into the E-Scoop lens, the image is enhanced and shifted to a different part of the macula allowing the patient to see better. Our trial set includes everything needed to properly fit your patient, complete instructions and a Practice Builder Program.